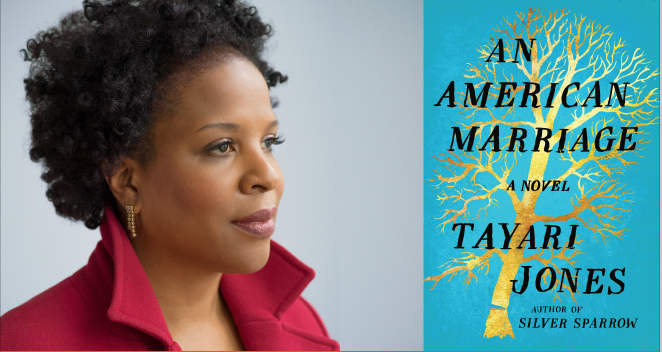 We are hosting award-winning author Tayari Jones on January 17 the third event of our SOLD OUT 2018/2019 season of Portland Arts & Lectures. Tune in to OPB Radio’s Think Out Loud at 12:00 p.m. on January 17 to hear Geoff Norcross interview Jones live from our community space in downtown Portland. During her time in Oregon, Jones will visit with students at Parkrose High School and local writers at our community space. In ninth grade, Jones enrolled in a high school that specialized in math and science, although she has said of herself that she “was not good at math and had no interest in science.” A year before graduation, her English teacher recognized her gift for writing and encouraged her to enter a city-wide creative writing contest, which she won by drawing heavily from her autobiography, penning a story about a “nerdy yet loveable teen” navigating the throes of teenaged love, friendship, and humiliation. In addition to her degree from Spelman College, Jones holds a Masters in English from the University of Iowa and an MFA in creative writing from Arizona State University. She has taught creative writing at the University of Illinois; George Washington University, where she served as the Jenny McKean Moor Writer in Washington; and Rutgers University—Newark. She is currently a Professor of English and Creative Writing at Emory University and a visiting fellow at the Black Mountain Institute at University of Nevada Las Vegas. Jones’s upbringing in Atlanta has strongly shaped her writing; the city serves as the setting for most of her works. She has said, “Atlanta is my natural habitat—I’m most myself when I’m home. It wasn’t until I left Atlanta, and started writing about it, that I realized how little the rest of the country knows about the city, or even the urban South.” Illuminating a piece of her city’s history, Jones’s first novel, Leaving Atlanta (2002), is a three-voiced, coming-of-age story set against the backdrop of the Atlanta Child Murders of 1979–81, and is based on her experience as a child in Atlanta during that period. It won the 2003 Hurston/Wright Legacy Award for Debut Fiction. In 2005, she published The Untelling, a vivid, unforgettable portrait of a woman in her mid-twenties seeking to overcome the trauma of her past. It was awarded the Lillian Smith Book Award. Her third novel, Silver Sparrow (2011), was added to the National Endowment for the Arts Big Read library of classics in 2016. It begins with the line, “My father, James Witherspoon is a bigamist,” and tells the story of a man’s deception, a family’s complicity, and the teenaged girls caught in the middle. Jones is a member of the Fellowship of Southern Writers. She has received a Lifetime Achievement Award in Fine Arts from the Congressional Black Caucus Foundation, as well as a United States Artist Fellowship, a National Endowment for the Arts Fellowship, a Radcliffe Institute Bunting Fellowship, and was named a Black Mountain Institute Shearing Fellow.